Need more information about booking Home 9253627 ? 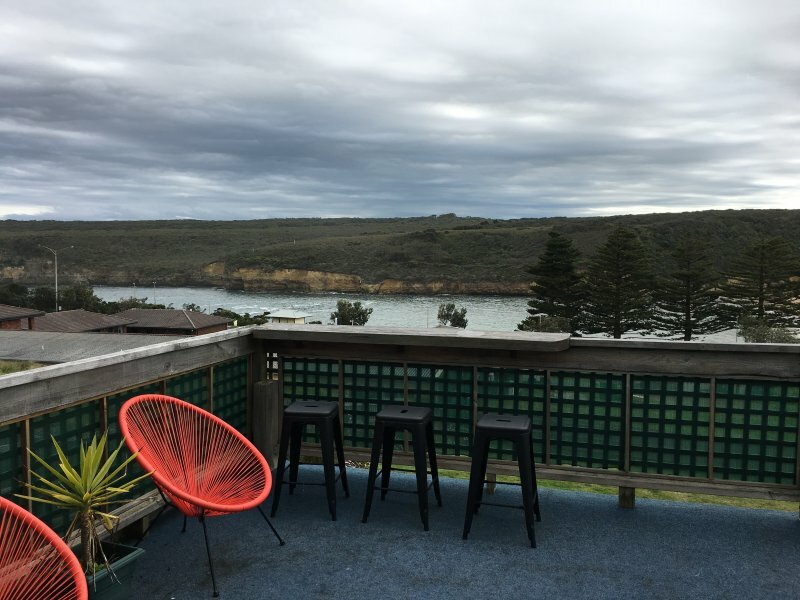 Cosy cottage nestled on the Port Campbell headland with spectacular bay views. Superbly positioned on a quiet street opposite national parks, giving it a secluded feel yet still being in the heart of the town. Offering a full kitchen, 2 queen beds & a bunk room it is perfect for families & groups, or couples who enjoy space. The large balcony overlooking the bay provides a great platform for star gazing, watching sunsets, listening to the crashing waves or just soaking up some fresh sea air. Plenty of free parking at the house for those on a self drive. Port campbell is quite isolated in terms of public transport but there is a V-Line service if you are up for a challenge. There is also a free shuttle bus that departs from the 12 Apostles car park and takes you to princetown to allow you to do the last leg of the Great Ocean walk if you are keen to explore on foot. Guests are provided with a code for the key safe so they can arrive as they chose. I am only a phone call away for any issues during your stay as I live close by. -pets allowed but conditions apply. - house is to be left tidy and dishes done, BBQ left clean or extra cleaning charges apply. - checkout strictly 10am unless prearranged. Late checkout of $50 per hour for unplanned late checkouts. You can get in touch with Mellissa (the owner) through the contact form on this page. Send Mellissa (the owner) an email through the contact form on this page. Alternatively, if there’s a phone number on this page, you can call them. How do I contact Mellissa (the owner)? If you’ve already booked, go to Manage your holiday booking to view Mellissa the owner's contact details or send them a message. Or send Mellissa (the owner) an enquiry through the Contact the owner/manager form if you’d like a quote or more info first. When you pay online through the Book your stay form, a booking request is sent to Mellissa (the owner). You’ll find out within 24 hours whether they’ve accepted - no money will leave your account before then. You can also request a quote from Mellissa (the owner) through the contact form. The owner will email you the total cost for your dates and a link to book and pay online. Use the Book your stay form to pay provisionally online. You can pay by credit/debit card or PayPal. Mellissa (the owner) will have 24 hours to accept the booking and no money will leave your account before then. Why can't I call Mellissa (the owner) before booking? You’ll need to contact Mellissa (the owner) to do this. Send them a message in Manage your holiday booking or through the contact form on this page. You can request to change the dates or number of people on your booking via the Manage your holiday booking page. To change your holiday dates use the Edit booking button. If you need to change the number of guests staying then send Mellissa (the owner) a message. If Mellissa (the owner) agrees, they’ll send you a revised quote outlining the changes. You can review and accept/decline this from the Manage your holiday booking page. You’ll have 48 hours to take action before the revised quote expires.